Educational Technology Guy: IBM Foundation launches free online software to help K-5 teachers prepare math lessons and help students learn. The IBM Foundation has launched a free, online software to transform the way K-5 teachers prepare math lessons and help students learn. 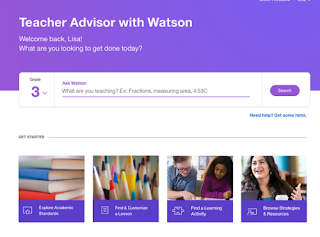 The software, called Teacher Advisor with Watson, uses Watson artificial intelligence technology to help teachers instantly find math resources. Teacher Advisor then dips into its library of 1,000+ videos and lesson plans, all based on national standards and vetted by top educators. Sign up takes 30 seconds. It is free and IBM promises it will always be free. It makes it easier to find lessons, standards, activities and much more and includes a lesson planning tool. For now, it is only for K-5 math instruction, with credible content vetted by educators. There is also instructional context support available to help teachers implement the content in the classroom. Take a look and sign up for free. ARMONK, NY –13 Sep 2017: As the new school year begins, elementary school teachers across the United States are now able to access a new, free online tool designed to provide elementary school teachers with targeted math resources for their kindergarten through fifth grade classrooms. Today, the IBM (NYSE: IBM) Foundation announced the availability of Teacher Advisor With Watson 1.0, software that uses Watson artificial intelligence technology and has been trained by some of the nation’s leading math experts, with feedback from more than 1,000 teachers across dozens of US states. The tool uses Watson Discovery Service, which can quickly analyze content for relevant concepts and deliver the most relevant material based on a teacher’s query. With more training and teacher use, Watson’s expertise and ability to provide targeted recommendations will continually increase.